As a horror movie setting, a groty carnival on the beaches of Santa Cruz in 1986 is a ready-made place to start. And so begins Us, Jordan Peele’s gripping new creep show. Carrying a bright-red candy apple that glistens in the moonlight, Adelaide could be Alice or Little Red Riding Hood or a new Stranger Things character when she enters a rickety walk-through attraction on the outskirts of the carnival that seems to exist outside of time. Its entrance sign promises visitors will “find themselves,” a pun that will soon manifest: Inside, Adelaide bumps into an exact replica of herself, and it’s terrifying. 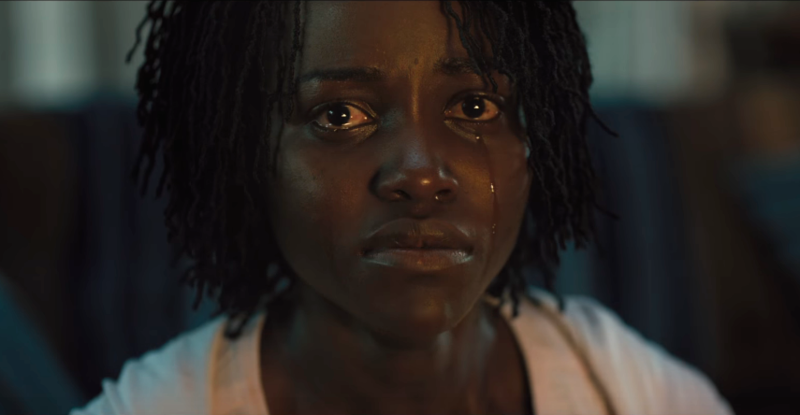 Anyone concerned that Jordan Peele would suffer the dreaded sophomore slump following the meteoric success of Get Out can rest easy, though if the film works its magic, you’re more likely to rest with one eye open. Us is a marvelously choreographed dance on the razor’s edge of comedy and terror, with a loaded narrative architecture borrowing from numerology (the 11:11 thing recurs), time slips, changelings and doppelganger mythology. Its tropes are gleaned from home-invasion thrillers and zombie apocalypses, and its subtext is a fierce, Romeroesque essay on inequality in America — and the vicious ascent of a quite literal underclass. Most of Us is set not in the 1980s but in present day, as Adelaide (Lupita Nyong’o), now a wife and mother to a nuclear family wealthy enough to own a summer home in California, visits the same Santa Cruz beach for the first time since the traumatic incident in the prologue. In tow is her husband Gabe (Winston Duke), a good-natured beta male, their teenage daughter Zora (Shahadi Wright Joseph), and their prepubescent child Jason (Evan Alex), who enjoys magic, masks and hiding in claustrophobic spaces, and possesses a better understanding of a world soon to be in tumult than anyone else. Their first stop is the shoreline, where they meet their friends Kitty and Josh (Elisabeth Moss and Tim Heidecker), whose even more prosperous lifestyle Gabe secretly envies. Josh possesses a luxury car and a yacht; Kitty just had some “work” done on her face — a subtle touch-up, she tells Adelaide, but vital. “Not that you need it,” she quickly adds. If these archetypes of the cosseted rich seem all too obvious, spend some time in Boca; they’re spot-on. The beach setting hasn’t changed much in three decades. In fact, the production design is rife with callbacks and duplications, the mise-en-scène a treasure trove of Easter eggs waiting to be discovered, like the constant doubling throughout The Shining — which, not coincidentally, was one of 10 horror films Peele had his cast watch before the shoot. I hesitate to reveal much more, because the visceral thrills of Us lie in its agile surprises, which continue up until the Shyamalanian twist in its coda. Suffice it to say that mongoloid doppelgangers are the source of conflict, and that all the actors are gifted with the opportunities of playing both their central characters and their soulless, feral clones — portraying Jekyll and Hyde, yin and yang. Much of the film’s sophisticated humor arises from the excessive comforts of the wealthy colliding with the urgencies of survival. There’s a brilliant joke about our overreliance on smart home technology and Alexa — here rebranded “Ophelia,” in one of the movie’s many examples of intertextuality — whose request to “call the police” becomes hilariously lost in translation. There is a satisfaction in seeing the idle rich receive their comeuppance. That we almost root for the movie’s ostensible villains is surely one of Peele’s objectives. Despite its supernatural conceit, he posits a familiar America or, as John Edwards memorably phrased it, two Americas, in which the success of one is often predicated on the suffering of the Other. Predatory capitalism is at the heart of this movie’s thematic baggage, much as racial appropriation elevated the genre thrills of Get Out. This, at least, is my interpretation. Get Out had a more transcendent clarity of focus; Us is more nebulous in its deeper meanings, which makes for a more enigmatic viewing, and probably a second or third sitting to grasp it all. This is a good thing, though I for one am so disturbed by what I’ve seen that I need a respite from it. Back home on the night of the advance screening, I happened to look at my nightstand clock for the first and only time that day. It shined 11:11. Seriously.